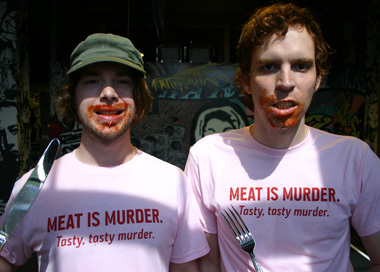 “Meat is Murder. . . . Though spectacularly hilarious, don’t expect Alchemist to come out with organic versions of either of these shirts any time soon. The patient, despite the million dollar work-up, had no definable pathology. Ken and I found the entrance to the 4-mile connector to the Benjamin Loop today. It’s about a mile past the Poorman’s turnoff. It’s got stairs. But it ain’t open yet, so don’t even think about rollin’ your fat tires on it. BTW, rode Super West Mag on Sunday. It’s dry and sweet.